Dark. Dark. Dark. 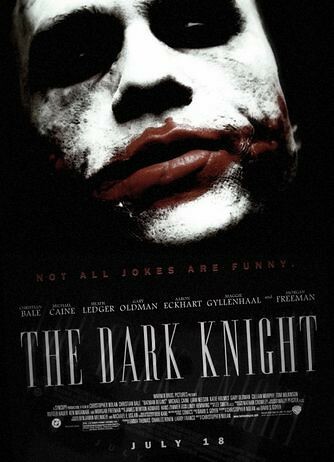 Dark Knight is a study of the evil in everyone. The center of the story is the Joker. I searched in vain for anything resembling Heath Ledger, the actor who played the Joker, and found only a soul in shambles, a horror show of lost humanity. Batman in comparison is wooden, predictable, only made interesting as he was drawn closer to the game the Joker played. Although his moral inflexibility results in him losing the people he loves. The Joker’s game is to turn everything upside-down, inside-out, and grinded into sloppy joes. And then convulse back again. His only goal is to create chaos for the sake of chaos. Morgan Freeman, who plays Batman’s inventor and business liaison, and Michael Caine who plays the butler, loyally cling to any sense of a moral compass. I wish these two had shared one scene at least. I wanted them to look at each other, and acknowledge the only other points of sanity in the movie. They wouldn’t even have to say anything. Just glance at each other. Then return to their jobs of eking out a sense of calmness and reason. I watched the movie with a late night audience that felt sinister to sit among. I’m sure it was just the usual stoned university crowd, but the Joker sucked me into his world of paranoia on the brink of violence. What a heavy movie. But I loved the risk it took for a Hollywood movie to embrace despair and pitilessly trample the notion of a happy ending.